Should I Get A Retention Holster For Open Carry? It's definitely a good piece of gear for the open carrier, along with a strong steel core gun belt to adequately secure one's carry gun. After all, safety is your job if you are carrying. 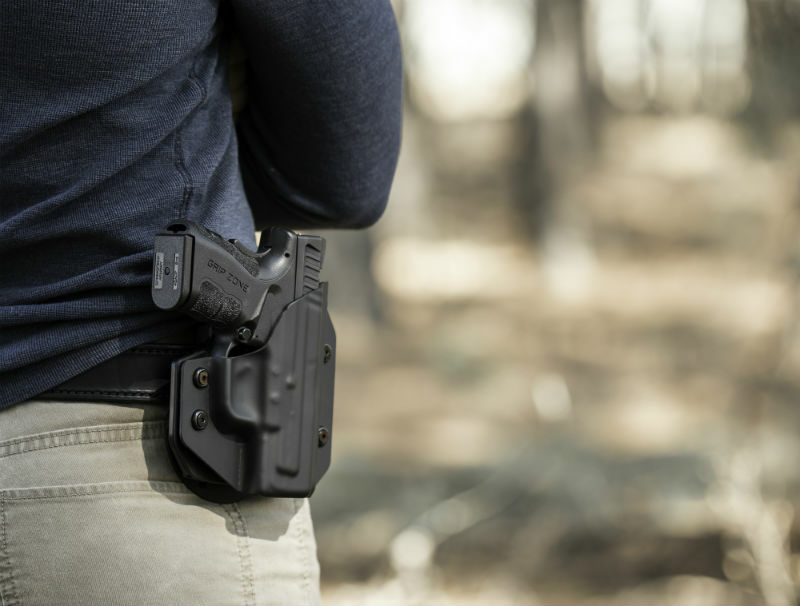 Though perhaps a better noun should be devised for them, retention holsters have a device that more strenuously holds a firearm in place than the typical holster otherwise might. 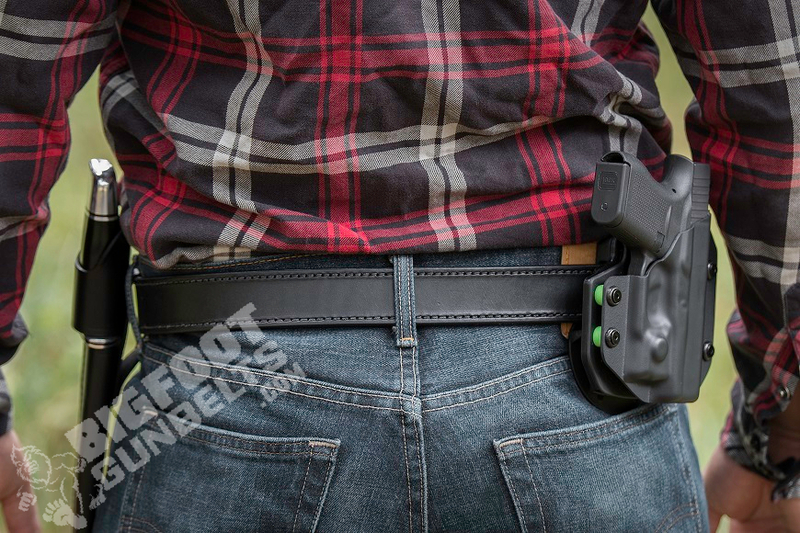 Granted, holster retention has come a long way in the era of the adjustable retention, as many holster designs allow for retention to be adjusted from loose to vise-like. The way a holster actually retains a firearm is by clamping down on a gun, to a degree, making it at least somewhat difficult to draw out. In essence, the tightest of non-retention holsters have an object inserted into it that's almost the same size as the compartment it sits in. That makes a tight fit. Most retention holsters, though, take things a step further, by adding at least one more barrier to drawing the pistol out. Thus, the pistol is not as easily drawn out of the holster but has to have the retention device disengaged in order to do so. While not unheard of on an inside the waistband holster, it's far more common for a retention device to only be employed on an OWB holster. Many retention holsters are either specifically made for or at least made with the military and police market in mind. For the professional, a retention device is simply a must as they need the security. After all, someone might try to take the gun away. It also prevents any possible drops or other jostling during physical activity. 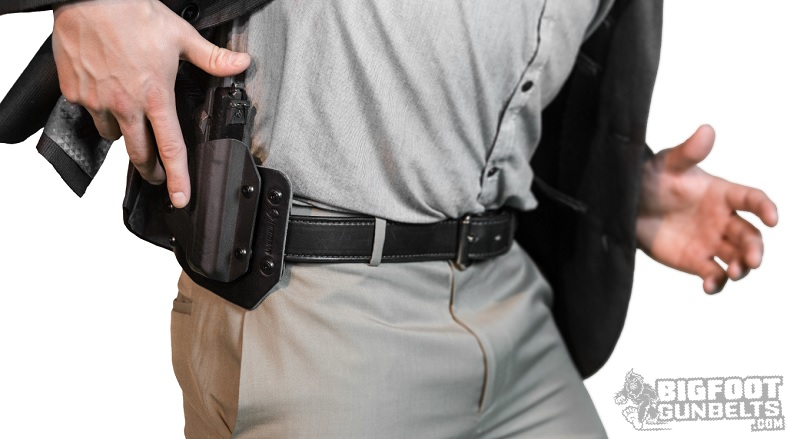 There are a few different types of holster retention, as a number of designs have come onto the market in recent years. Most common is the thumb break, and thumb break holsters are offered by nearly every major player in the market. Thumb break holsters employ a strap, leather or nylon in most cases, that close on the grip of the gun and most often just under the beavertail of the rear of the frame. The strap keeps the pistol secured in the holster. Thumb break straps have been offered on holsters for more than a century, and it has remained the dominant retention device for a simple reason: it works, and works well. A cheap nylon holster, for instance, has no retention on it's own. Add a thumb break, though, and it becomes adequate. A more recent invention is the trigger guard lock. Trigger guard lock holsters employ a locking mechanism - it can be as simple as a bar latch that catches the inside of the trigger guard and holds it in place - that engages as the pistol is holstered. To draw, the retention device has to be disengaged. There are a number of such designs on the market. Typically, the release is on the outside of the holster, requiring the user manipulate it with a finger prior to drawing. While many such holsters are made with the tactical or duty market in mind, some are classed up by mounting the retention device inside a leather holster, and we all know how classy a good piece of leather is. A person might even be able to color coordinate, so the holster matches their leather ccw belt. 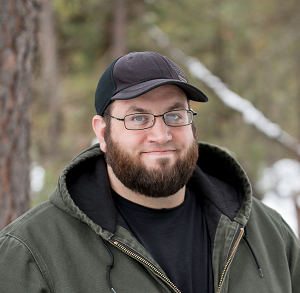 Why Should I Consider A Retention Holster For Open Carry? When open carrying, your firearm needs to be as secure as possible, which is why a retention holster is a good idea. This keeps the pistol securely in its place, and precludes the possibility of it being dropped or otherwise coming out of the holster unless you mean it to. 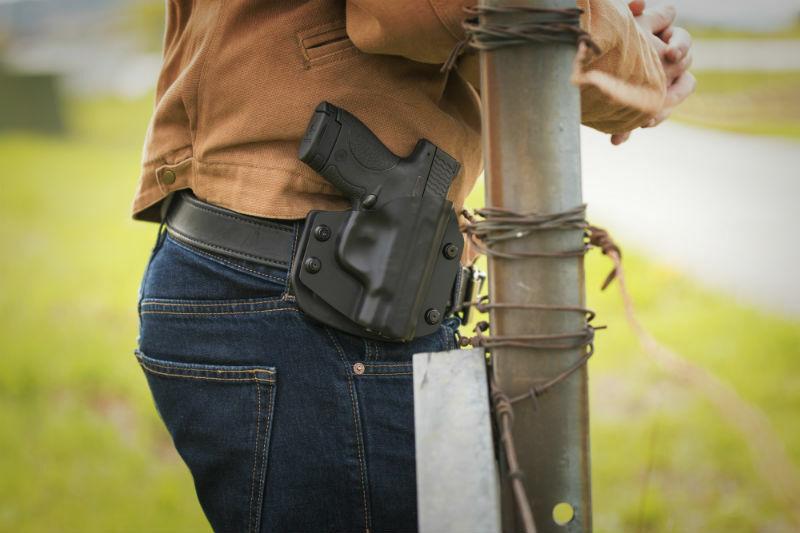 It's just a safe way to carry, that's why the professionals - such as law enforcement and the military - employ retention holsters while on duty. If you carry this way, incorporate the retention device into training. Practice undoing the strap or disengaging the locking mechanism. That way, the pistol can be accessed more quickly as you'll be relying on muscle memory to get the gun into the fight.